New Zealand calendar and planner in the 300x300mm format in five languages - holidays are not marked. You can add short notes into the small day-fields to use this calendar as a planner too. 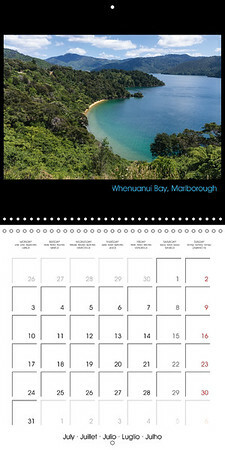 Preview of all calendar pages with photos from the North and South Island of New Zealand. The New Zealand square format calendar contains 13 photos taken during a bike adventure that took me from Auckland on the North Island of New Zealand to Christchurch on the South Island. You can follow my journey on my blog while having the photos in your home. This calendar is available as a 300x300mm (11.58x11.58 inch) wall calendar with English titles at: Amazon, Speedyhen or your local bookstore.